Strong-willed and talented, landscape designer Sabine De Barra works in the gardens and countryside of 1682 France. When she is unexpectedly invited to apply for an assignment at the court of King Louis XIV, his landscape artist André Le Notre is initially disturbed by Sabine's distinctive eye and forward-thinking nature, but chooses her to build one of the main gardens at new Palace of Versailles. 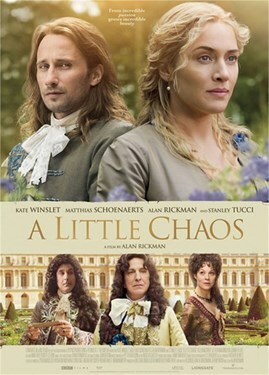 Pressed for time, Sabine charts her own course and Le Notre comes to recognize the value of "a little chaos" in her process. During the project, Sabine negotiates the perilous rivalries and intricate etiquette of the court, and as she challenges gender and class barriers, forges a surprising connection with the King himself, and a vote of confidence from his brother, Philippe. Gradually coming to terms with a tragedy in her past, Sabine's professional and personal interactions with André bring out honesty, compassion, and creativity in both of them.